Want a fun way to practice letter formations? 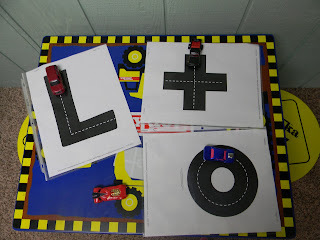 Check out these printable letters, shapes, and numbers at Making Learning Fun. I printed the letter "L" for Logan as well as the cross and the circle. (We've been working on writing those two shapes in our Handwriting Without Tears Curriculum). I set them out as an invitation for "writing" practice. Ps. Look at those cars modeling top to bottom, left to right directionality! What good cars! Want more Cars fun? Enter to win a Cars 2 Fun Pack! (Cars 2 T shirt, temporary tattoos, bumper tickets, and a puzzle). Giveaway ends July 1, 2011. Thanks for sharing the Highway ABC Cards. These are PERFECT for my 2 car lovers!! Thank you! This is such a fabulous idea! My preschooler always wants to write from bottom to top instead of top to bottom so this is definitely something that would help him out. And since it's fun, it won't even seem like work at all for him! Thanks for sharing this and for stopping by my blog!